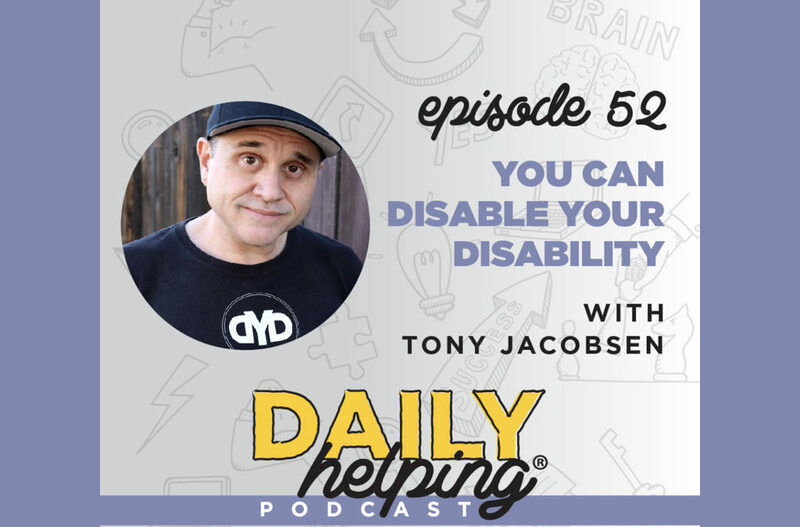 Today our expert guest is Tony Jacobsen, a personal trainer and the author of Disable Your Disability: Live The Healthy Life You Deserve! Tony was born with a rare bone disorder (Osteogenesis Imperfecta) that makes his bone brittle, and after years of being held back because of it and being extremely unhealthy, he flipped the switch and learned to embrace it. Now, at the age of 46, he is living a healthy, high-powered, and happy life – and his mission is to help others do the same. By the time Tony was 42, he was in the worst shape of his life. He was in pain every day, and he had no strength. When he went to the doctor, he learned that he had had a heart attack. Tony realized he had to push himself and do something that scared him, so he went all-in and hired a personal trainer. He needed help, and he wanted someone to guide him – something he now does for others. He got stronger physically, but more importantly, he got stronger mentally and emotionally. A lot of times, Tony says, people with disabilities have trouble asking for help – and I think this is something that we all experience, at some point or another. We feel like it is showing a sign of weakness, but nothing could be farther from the truth. Disable Your Disability: Live The Healthy Life You Deserve!